The music video on the NASA Johnson YouTube channel The Sound (& Visions) of Silence shows images and video of Earth taken from the ISS by astronauts Sergey Ryazanskiy, Paolo Nespoli, and Commander Randy Bresnik. Between 01:02 and 01:10 there is shown a photo of a city(?) area with bright sodium street lighting and dimmer white lights, and in the center is a bright lit white area and what looks like light shining straight up. Any ideas where in the world this is, and if this is a concert, or a brightly lit public area, or what else has produced all of this light? Are these spotlights, or is this somehow reflected moonlight? 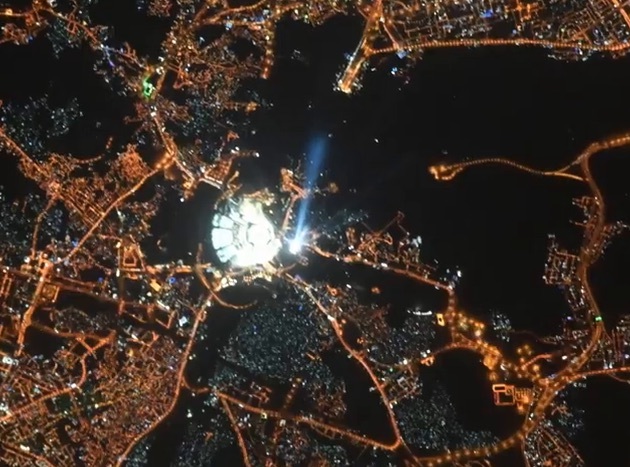 Captured by astronauts Sergey Ryazanskiy, Paolo Nespoli, and Commander Randy Bresnik, the video features stunning footage of Earth and outer space from the International Space Station in low-earth orbit during the months of August through October in 2017. 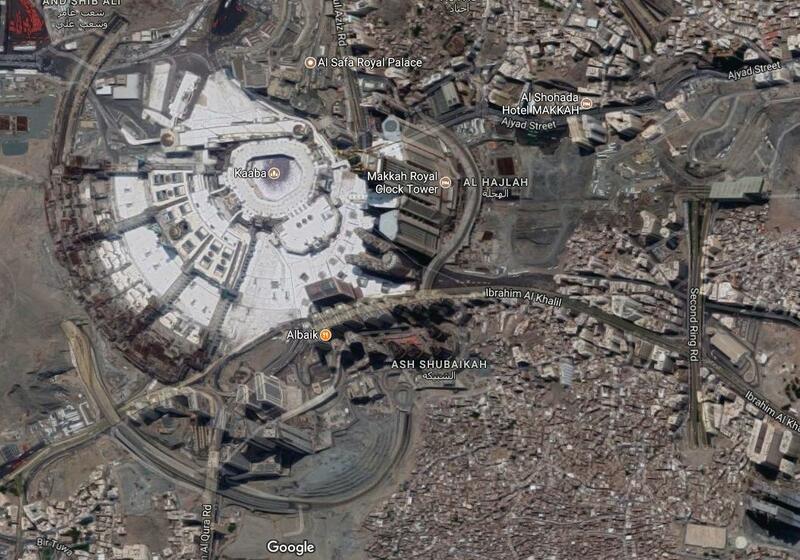 Well I confirmed via Google Maps that this is Mecca. 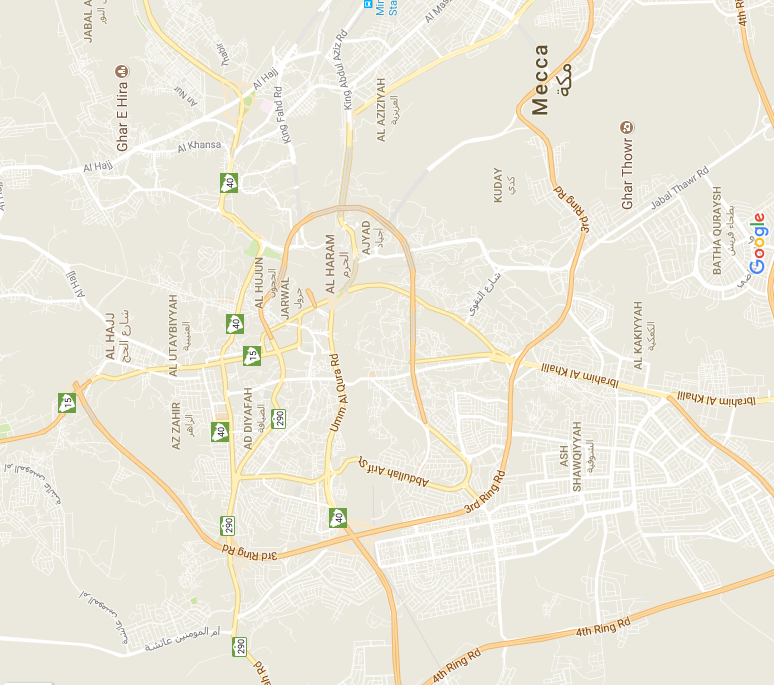 As shown in the map and image below the roads align with those lighted in the image. The dark areas in the first image are steep hills to the East. 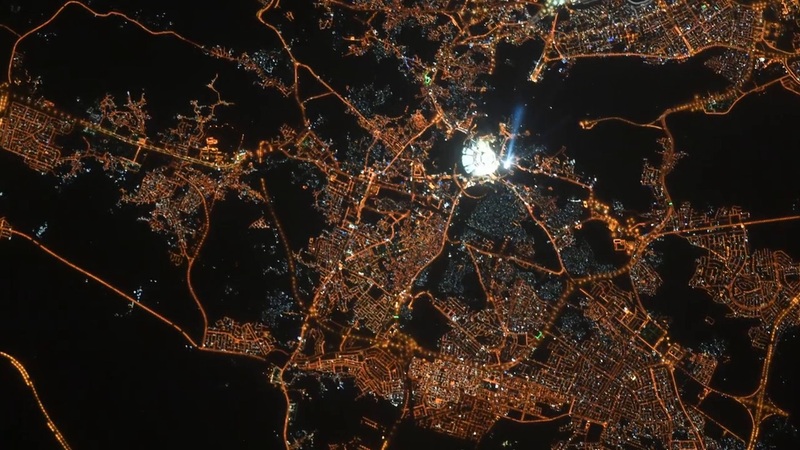 The brightly lit region is the Kaaba and large Masjid al-Haram Mosque, and the bright up light is indeed the Makkah Royal Clock Tower. Possibly Mecca, Google image search indirectly led me to a facebook post dated 4th September claiming to be Sergey Ryazanskiy's claiming the images were of Mecca. If this is the case the uplight may be the Makkah Royal Clock Tower, which according to wikipedia "On special occasions such as new year, 16 bands of vertical lights shoot 10 km (6.2 mi) up into the sky." Not the answer you're looking for? Browse other questions tagged iss low-earth-orbit identify-this-object earth-observation space-art or ask your own question. Are these images from Planet Labs? Are the images publicly available? What are these bright streaks in MODIS Earth images? Why are they shaped this way?